useful and which have an extraordinary range of properties and applications. How these monomer molecules are connected in the polymer chain defines the molecular architecture of polyolefins. 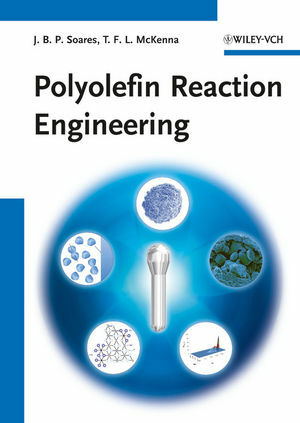 using elegant mathematical modeling techniques to relate polymerization conditions, reactor and catalyst type to polyolefin properties. types of reactors and processes are used to create the different products. Aimed at polymer chemists, plastics technologists, process engineers,the plastics industry, chemical engineers, materials scientists, and company libraries. João B. P. Soares is Professor in the Department of Chemical Engineering at the University of Waterloo, Canada. He has also worked as a research and development engineer at Pronor, COPENE, and Polibrasil in Brazil. He obtained his PhD from McMaster University working with Professor A. E. Hamielec. He has authored more than 160 articles in refereed journals and 11 book chapters. Professor Soares is a Fellow of the Chemical Institute of Canada and is the recipient of the Premier's Research Excellence Award, the Union Carbide/ Dow Innovation Award, and the Syncrude/ CSChE Canada Innovation Award for contributions to Chemical Engineering under the age of 40. He is also Editor-in-Chief for the Canadian Journal of Chemical Engineering and a member of the Executive Advisory Board of Wiley-VCH Macromolecular Journals. He is a consultant for several polyolefin-manufacturing companies in Canada, USA, Europe Asia, and Brazil. Timothy F. L. McKenna is a Directeur de Recherche (DR2) at the Laboratoire de Chimie, Catalyse, Polymères et Procédés (C2P2, a CNRS laboratory), in Villeurbanne, France. He obtained his PhD in Chemical Engineering from the University of Massachusetts at Amherst, then moved to France to work with Elf-Aquitaine an Atochem on modeling polyethylene particle growth. After three years with Elf-Atochem, he joined the academic world in 1993 at the Laboratoire de Chimie et Procédés de Polymérisation (LCPP, CNRS). Since then Dr. McKenna has authored or co-authored more than 180 papers and 8 book chapters, and is a consultant at companies in Europe, the middle East and Asia. He is currently an active participant in the Dutch Polymer Institute (DPI), an associate editor of the Canadian Journal of Chemical Engineering, and serves in the International Advisory Board of 2 Macromolecular Journals, and of Chemical Engineering Technology, all from Wiley-VCH. Prof. Soares and McKenna have given in-house industrial short courses on Polyolefin Reaction Engineering to many polyolefin manufacturing companies worldwide. They also offer an annual short course on the same topic open to industrial and academic participants.